A couple weeks ago, my family was battling the terrible flu bug, so we all stayed home from church. That afternoon, the kids were getting restless so we decided to make some turkeys, using our hands as patterns. My favorite was my nine-year-old daughter's hilarious perception of Thanksgiving--check it out, from the Turkey's Point of View. We hung everyone's pictures up on the wall for some Thanksgiving cheer. We're so thankful for our family, our friends, a warm home, and plenty of good food. We hope that you have a super smashing Thanksgiving and that you eat plenty of mashed potatoes! Hi! 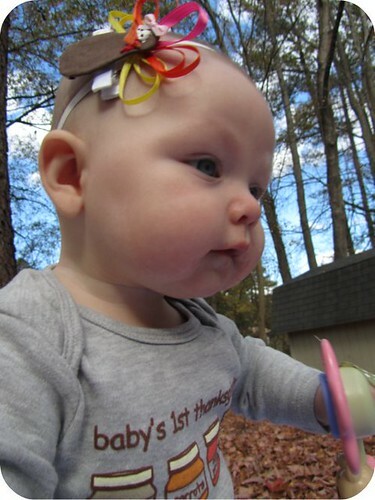 My name is Brave Brooke and I blog over at Wayward Girls Crafts with my three sisters and mom. 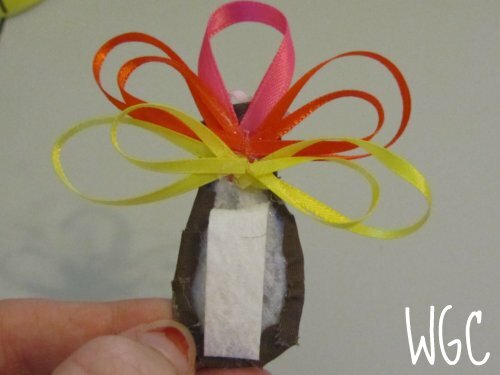 We have high hopes for crafts that don't always turn out perfect. 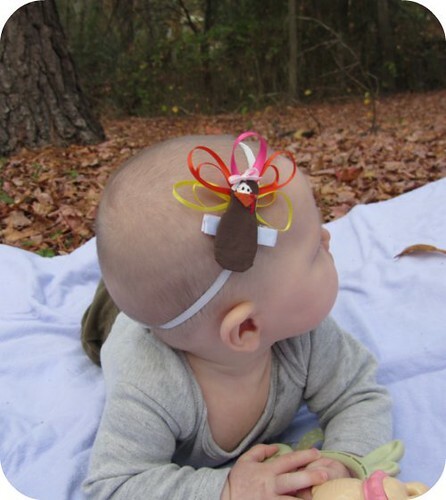 I have an 18 month old little girl and last year for her first Thanksgiving I made her a cute turkey bow. We're in the "no bow is a good bow" stage with her and most of the time they are discarded within 30 seconds so I'm not sure I'll be able to get her to wear it this year! 1. I cut out the shape of the turkey body out of interfacing. I cut the fabric just bigger than the body and glued it on the front. I then cut slits around the edge of the body so it would lay flat while I glued it around the edge. 2. I cut the ribbon in pink 3.5" x1, orange 3.5" x2 and 2.5" x2, and yellow 3.5" x2 and 2.5" x2 lengths. I looped them and hot glued them. 3. 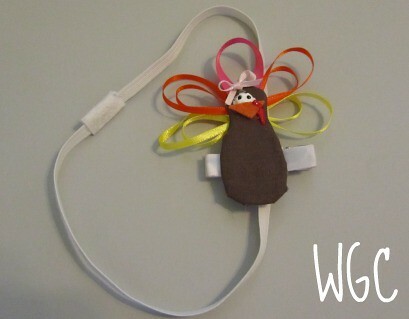 I glued them onto the back of the turkey with the small loops in the middle of the large loops. After all this I smeared the eye so I put a bow on the Turkey because she's a girl. 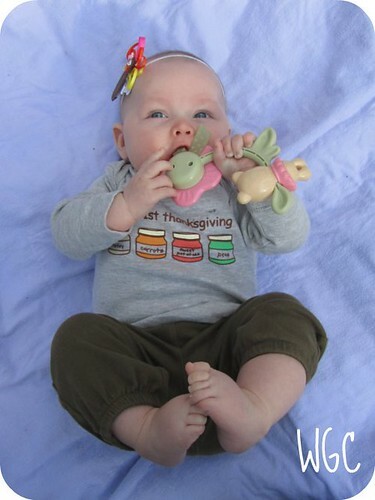 Here is her whole Thanksgiving Day outfit: Isn't she a cutie!? Her onesie is courtesy of her Aunt Jaime. My daughter was being a total stinker and wasn't smiling. I have some more bow tutorials found here. We would love to have you stop by and say hello! I love the smell of an apple pie baking. It makes your house feel all warm and cozy--and it's easy--even the crust part. Since Thanksgiving is next week, I thought I'd share my super easy pie crust recipe. It's a very basic recipe. First, you must know that I started out as an awful crust maker. Nothing about my crusts were appetizing. So much so that my husband quickly took over the crust making task. I practiced in secret--okay, okay--he was at work and half the time that was in our unfinished basement furnace room. (The aesthetics were a little lacking considering he is a graphic artist. Maybe the lack of distraction got his creative juices going. But I digress.) I made many, many, horribly awful crusts before I understood not to add too much water. This one principle changed my pie making life. Let's get started. Then put a couple of ice cubes in a 3/4 cup measuring cup and fill with water. Add the shortening to the flour mixture. Use a pastry blender to combine the flour and shortening. An electric beater works nicely if you don't have a pastry blender. You are trying to turn the flour into flour-shortening crumbs--so keep at it until the shortening and flour mixture are incorporated together. Now slowly drizzle ice-cold water over the mixture as you stir it with a spoon. Go easy on the water. This is done. I won't add anymore water. Divide the dough in half. Place half the dough between two sheets of plastic wrap and roll out quite thin. Peel back the top layer of plastic wrap. I have all kinds of helpers today owing to the fact that it's 4:30 on a fast Sunday. They're starving! Lift the crust off the counter and carefully flip and place in a pie dish. Gently peel off plastic wrap and lift the edges of the pie crust to help it settle into the bottom of the pie plate. While I made the crust, my girls used the apple peeler, corer, slicer on about 20 very small apples. We've gone through all of our tart apples and are now left with these sweet things. Here is the key to using sweet apples in apple pie: lemon juice--and lots of it. Don't be shy about it. Stir in some sugar. How much is up to you, but I'll post a range at the end for anyone who's nervous without specifics. some flour. Stir and taste it. It was still too sweet so we added more lemon juice...sure wish we had some Elstar apples left. Pour apples into waiting pie crust. Turns out 20 small apples was a few too many. No problem, the starving helpers finished off the leftovers before I finished the crust. Fast Sundays, with church ending at 4:00 and a Mom insisting we make dessert first so that maybe Dad will be home to join us for dinner when we sit down to eat, will do that to munchkins. Roll out the second half of dough in the same manner. Place the crust on top of the apples. Hold the pie plate in waiter-serving fashion with the hand that you don't write with. Use the back of a table knife to cut the two layers of crust even with the pie pan. You may have noticed the hole in the previous picture where the crusts didn't quite meet. This is not a time for panic. Pick up a piece of the crust you just cut off and place it over the hole like so. You'll see that I have two such places to mend. Pat the extra piece into place and trim the excess. There are a couple of ways to seal your two crusts together. This method is fast and easy. Check cookbooks for other methods. Pinch the crust all the way around. Poke the crust with a fork at regular intervals. This allows the steam to vent. Sometimes Nate will cut out cool designs in the top of the crust because he's pretty talented, but I just use a fork. Sprinkle with a good coating of sugar and bake. See, it's not so bad. Now you can eat dinner while the smell of a baking apple pie fills your house and makes it all warm and cozy. It's best to let your pie set up for and hour or two before you serve it. That never happens at our house. Top with whipped cream and enjoy the taste of fall. Mix flour and salt together. Use a pastry blender (or electric beaters) to combine flour and shortening. Slowly add ice-cold water until barely moistened. Makes two pie shells. Combine and stir to coat apples. Pour into pie shell and top with pie crust. Sprinkle with sugar if desired. Bake at 375° for 45-50 minutes. Let cool and top with whipped cream if desired. Enjoy! a birthday card and how I made it. but I'm going to tell you here how to make it. The one I made for the tutorial isn't a birthday sentiment, but that's okay. that measures 11" x 4 1/4"
cut in half the long way. Next you will score from one corner to the opposite corner. 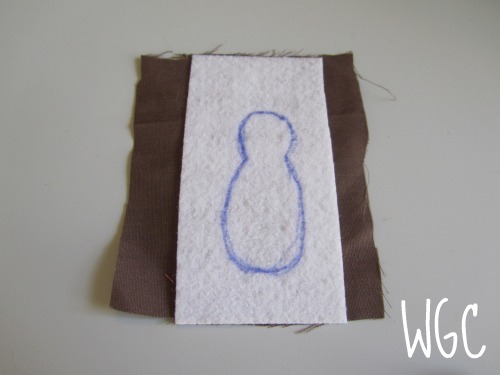 To do this you can use your cutter and line it up like I did above, or you can use ruler or a scoring board. Use a stylus or bone folder to score. If you don't have either of these you can use a blunt tip of any kind, try the end of a dinner knife or the outside of a pair of scissors. you don't want to cut the paper, just score it. Now fold it on the scoreline and make a nice sharp fold. Next you will score it in the middle and fold on that scoreline. You now have your basic card and are ready to embellish it with some of your favorite papers. Once you have it traced, cut the paper on the lines. but I like to have a bit of the white card base showing, so I trim each side down a little bit. a glue stick worked just fine for me. On the inside, I lay the cut piece on the base and mark on either side of the fold, then cut on these lines before gluing down. You can leave it in there and just score it, but I find that the card will fold much nicer if there are fewer layers of paper. This is what the inside of the card will look like once everything is glued down. to the red side with foam tape. Using foam tape helps it to lay flat. money or maybe some pictures. you can simply use double sided card stock, like I did with this one. It's quick and easy and really takes very little time this way. It all depends on the papers you want to use and how much time you want to spend and how fussy you want to be. Until next month, Craft On!